Alternative Criminologies celebrates a kaleidoscopic process of permanent critique and a diversity of social and scientific knowledges. It examines complex and global crime issues in light of the many alternative scientific, artistic, empathetic, campaigning and otherwise imaginative criminologies that attempt to understand and/or fundamentally change why crime and justice take the forms they do. From cutting edge topics such as crimes against humanity, the criminology of mobility, terrorism, cybercrime, corporate crime and green criminology; to gendered perspectives on violence against women, sexualities and feminist and queer criminologies; to key issues in penology such as mass incarceration, the death penalty, desistance from crime, risk and the political economy of punishment; Alternative Criminologies demonstrates the breadth, the variety and the vibrancy of contemporary perspectives on crime, criminalization and punishment. Bringing together 34 leading experts from around the world, this international collection unites fresh and insightful theoretical positions with innovative empirical research and marks an important juncture for criminologies and their imagined futures. 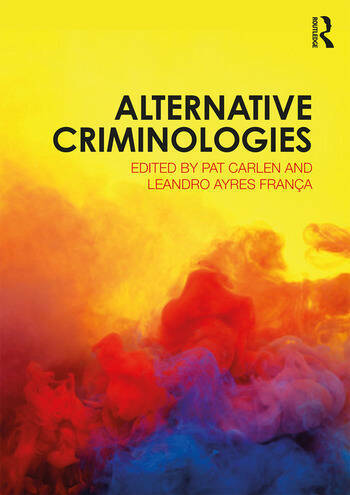 Alternative Criminologies is essential reading for students of crime and criminal justice. Pat Carlen is Visiting Professor at the Open University, UK and has published over 20 books on criminal and social justice. Co-founder (with Chris Tchaikovsky) of the UK campaigning group Women in Prison and Editor-in-Chief of the British Journal of Criminology 2006–2013, she has also been a recipient of: the American Society of Criminology’s Sellin-Glueck Prize for Outstanding International Contributions to Criminology, the British Society of Criminology’s Award for Outstanding Achievement and an honorary Doctorate of Laws from Lincoln University. Leandro Ayres França works as a professor, researcher, writer and translator. He is Professor of Criminology, Criminal Law and Criminal Procedure at Faculdade Estácio Rio Grande do Sul; Coordinator of Estácio’s Criminology Graduation Program; Doctor and Master in Criminal Sciences by Pontifícia Universidade Católica do Rio Grande do Sul’s (PUCRS) Criminal Sciences Graduation Program. He is coordinator of the Contemporaneous Criminologies Study Group, member of the research group Modern Trends in Criminal System and host of the radio program Café e Fúria.